Customize your truck with a choice of six impressive paint jobs inspired by elemental forces! 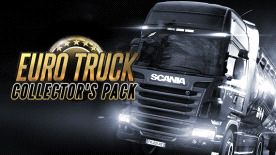 Trucks & Trailers puts your driving skills to the ultimate test with 50 individual truck driving challenges. Compete against the clock to complete intricately designed courses and tasks that put you firmly into the driver's seat. Can you avoid obstacles whilst reversing a trailer? Do you have the lateral thinking required to sort a series of trucks & trailers in the yard into their correct positions? Can you park with precision? As your skills increase, upgrading the difficulty level will guarantee that there is always a task that will put you and your truck to the ultimate test! At the highest difficulty setting external camera views are disabled, forcing you to maneuver like the pros using only in-cab mirrors. A test that will award you the gold medals and the honor of being a real trucking titan!